Sausalito is a San Francisco Bay Area city in Marin County, California. Sausalito is 8 miles (13 km) south-southeast of San Rafael, at an elevation of 13 feet (4 m). The population was 7,061 as of the 2010 census. The community is situated near the northern end of the Golden Gate Bridge, and prior to the building of that bridge served as a terminus for rail, car, and ferry traffic. Developed rapidly as a shipbuilding center in World War II, the city's industrial character gave way in postwar years to a reputation as a wealthy and artistic enclave, a picturesque residential community (incorporating large numbers of houseboats), and a tourist destination. It is adjacent to, and largely bounded by, the protected spaces of the Golden Gate National Recreation Area. The name of Sausalito comes from Spanish sauzalito, meaning "small willow grove", from sauce "willow" + collective derivative -al meaning "place of abundance" + diminutive suffix -ito; with orthographic corruption from z to s due to seseo; early variants of the name were Saucelito, San Salita, San Saulito, San Salito, Sancolito, Sancilito, Sousolito, Sousalita, Sousilito, Sausilito, and Sauz Saulita. The area acquired this name as a result of the so-called Bandit Wars, when the defeated Latinos, a mixture from Mexico, Chile and Panama, banned from San Francisco settled at what was to become the North end of the future Golden Gate bridge. It was named so in honor of their leader, the Chilean Joaquín Murieta, who was born in a district of the main Chilean port, Valparaiso, called Sausalito. Located at Lua error in Module:Coordinates at line 668: callParserFunction: function "#coordinates" was not found., Sausalito encompasses both steep, wooded hillside and shoreline tidal flats. According to the United States Census Bureau, the city has a total area of 2.2 square miles (5.7 km2). Notably, only 1.8 square miles (4.7 km2) of it is land. A full 21.54% of the city (0.5 square miles, or 1.3 km²) is under water, and has been so since its founding in 1868. Prominent geographic features associated with Sausalito include Richardson Bay and Pine Point. File:1781 Cañizares Map of San Francisco Bay.pdf The first European known to visit the present-day location of Sausalito was Don José de Cañizares, on August 5, 1775. Cañizares was head of an advance party dispatched by longboat from the ship San Carlos, searching for a suitable anchorage for the larger vessel. The crew of the San Carlos came ashore soon after, reporting friendly natives and teeming populations of deer, elk, bear, sea lions, seals and otters. More significantly for maritime purposes, they reported an abundance of large, mature timber in the hills, a valuable commodity for shipwrights in need of raw materials for masts, braces and planking. The development of the area began at the instigation of William A. Richardson, who arrived in Upper California in 1822, shortly after Mexico had won its independence from Spain. An English mariner who had picked up a fluency in Spanish during his travels, he quickly became an influential presence in the now-Mexican territory. By 1825, Richardson had assumed Mexican citizenship, converted to Catholicism and married the daughter of Don Ignacio Martínez, commandant of the Presidio and holder of a large land grant. His ambitions now expanding to land holdings of his own, Richardson submitted a petition to Governor Echienda for a rancho in the headlands across the water from the Presidio, to be called "Rancho Saucelito". Sausalito is believed to refer to a small cluster of willows, a most-soil tree, indicating the presence of a freshwater spring. This era came to an end in May 1937, with the opening of the Golden Gate Bridge. The bridge made large-scale ferry operations redundant, and since the new route of Highway 101 bypassed Sausalito entirely, in-town traffic was quickly reduced to a trickle. Car ferry service ended in March 1941 (passenger ferry service, however, continues to this day, linking downtown Sausalito with both the Ferry Building in San Francisco's Embarcadero, and Pier 39 in the Fisherman's Wharf district). 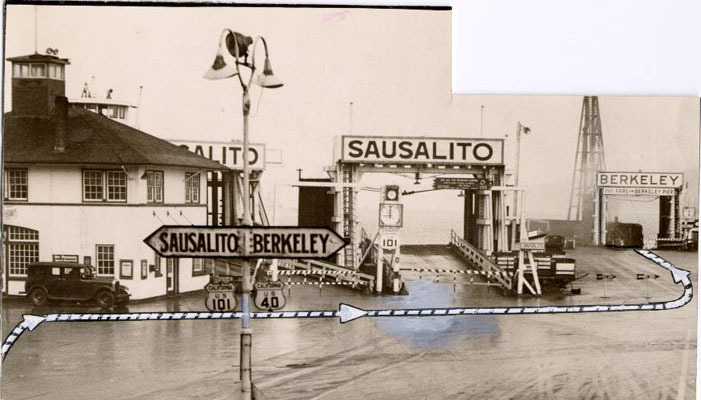 Northwestern Pacific also closed its Sausalito terminal in March 1941, although some tracks remained in use as "spur tracks" for freight trains as late as 1971. The 2010 United States Census reported that Sausalito had a population of 7,061. The population density was 3,128.5 people per square mile (1,207.9/km²). The racial makeup of Sausalito was 6,400 (90.6%) White, 65 (0.9%) African American, 16 (0.2%) Native American, 342 (4.8%) Asian, 10 (0.1%) Pacific Islander, 53 (0.8%) from other races, and 175 (2.5%) from two or more races. Hispanic or Latino of any race were 287 persons (4.1%). As of the census of 2000, there were 7,330 people, 4,254 households, and 1,663 families residing in the city. The population density was 3,852.9 people per square mile (1,489.5/km²). There were 4,511 housing units at an average density of 2,371.1 per square mile (916.7/km²). The racial makeup of the city in 2010 was 87.4% non-Hispanic White, 0.9% non-Hispanic African American, 0.2% Native American, 4.8% Asian, 0.1% Pacific Islander, 0.3% from other races, and 2.2% from two or more races. Hispanic or Latino of any race were 4.1% of the population. In the city the population was spread out with 7.4% under the age of 18, 2.4% from 18 to 24, 39.5% from 25 to 44, 38.5% from 45 to 64, and 12.3% who were 65 years of age or older. The median age was 45 years. For every 100 females there were 93.5 males. For every 100 females age 18 and over, there were 93.8 males. Service organizations in Sausalito include the Lions Club, Rotary Club, Sausalito Woman's Club, Sausalito Historical Society, the Sausalito Library Foundation, Friends of the Sausalito Library, Sausalito Art Festival Foundation and the Sausalito-on-the-Waterfront Foundation. Clubs include the Sausalito Yacht Club, Presidio Yacht Club and the Sausalito Cruising Club. The Sausalito Yacht Harbor has slips for 600 vessels and is the southernmost harbor in Sausalito and is adjacent to the central downtown area. Sausalito has a local newspaper called the MarinScope, owned by Vijay Mallya and edited by Jessica Mullins. Sausalito also has a small radio station founded by Jonathan Westerling, Radio Sausalito 1610 AM, which also serves as the city's Emergency Broadcasting System. The city's primary websites are the City's official site ci.Sausalito.ca.us, the Chamber of Commerce sausalito.org, a reference site oursausalito.com and a guide for locals and visitors to the area Sausalito.com. Sausalito is served by the Sausalito Marin City School District for primary school and the Tamalpais Union High School District for secondary school. Residents have two public schools to choose from: the K-8 public school Bayside/Martin Luther King Academy in Marin City or the K-8 charter school Willow Creek Academy in Sausalito. There are two private elementary schools that have been newly established in Sausalito, The K-8 Waldorf style New Village School, and PreK - 5 campus of the Lycée Français de San Francisco. High schoolers attend Tamalpais High School in Mill Valley. The roots of the Houseboat Community lie in the re-use of abandoned boats and material after the de-commissioning of the Marinship shipyards at the end of World War II. Many anchor-outs came to the area, which created problems with sanitation and other issues. After a series of tense confrontations in the 1970s and 1980s additional regulations were applied to the area and the great majority of boats were relocated to approved docks. Several are architect-designed pieces that have been featured in major magazines. The Gates Co-op Houseboat Community remains to this day, although recent action has required them to fit city-standards of sanitation and building codes. There is a new dock, approved by the city, being built, where all residents will have to relocate to avoid legal action. The humming toadfish makes mating noises underwater, keeping some residents awake at night and inspiring the Humming Toadfish Festival. Leon Adams, wine writer and author of Wines of America lived in Sausalito until his death. Antenna Audio has a branch in Sausalito. The bakery concern Pepperidge Farm, which markets The American Collection line of cookies named after various notable locales (Chesapeake, Nantucket, Tahoe), has given the name Sausalito to their milk chocolate/macadamia-nut combo. It is not manufactured in the city. As of 2011, the company maintains a registered trademark on the name Sausalito. In the 1978 comic farce mystery detective thriller Foul Play Gloria Mundy, played by Goldie Hawn comes under the protection, broadly speaking, of San Francisco detective Lt Tony Carlson played by Chevy Chase who happens to have an especially charming houseboat in Sausalito. Albert Brooks' Mother (1996), employs the town as the setting for its story, which features several shots of Sausalito throughout. Huey Lewis and the News, the Dave Matthews Band, Journey and Bob Marley recorded albums at the Record Plant in Sausalito. ↑ National Park Service. (2005). Cultural Landscape Report for Fort Baker, Golden Gate National Recreation Area. ↑ A Short History of Liveaboards on the Bay, Larry Clinton, Bay Crossings, August 2001. ↑ 34.0 34.1 "SCHOOLS in the Tamalpais Union High School District and communities served." Tamalpais Union High School District. Retrieved on April 1, 2010. ↑ "K-8 Comprehensive Education Program." School(Archive) Sausalito Marin City School District. Retrieved on February 3, 2013. ↑ "Parks & Facilities." City of Sausalito. Retrieved on February 4, 2013. ↑ Hum along with male plainfin midshipman fish. Morning Edition. National Public Radio. July 29, 2009. ↑ Bishop, K. Sausalito Journal; Voice of the turtle? No, toadfish love song. New York Times. June 26, 1989. ↑ Sounds of the Plainfin Midshipman. Underwater Sound from the RTC Pier. Underwater Acoustics Research Group. San Francisco State University. ↑ Perlman, D. Hormones fine-tune the humming toadfish: High levels of estrogen found in the most responsive females. San Francisco Chronicle. July 19, 2004. This page was last modified on 29 December 2015, at 01:01.